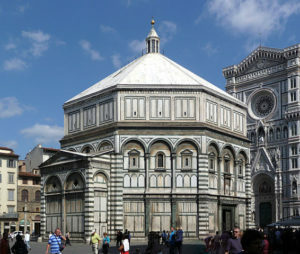 In anticipation of peak summer tourist season, the Duomo cathedral complex in Florence is stepping up security measures by installing seven metal detectors in the building. The new walk-through metal detectors will replace the old handheld detectors, with the goal of reducing the time spent waiting to clear security and helping the monuments’ 1.4 million annual visitors access the sites more quickly. The Duomo also plans to add storage space for bags in the near future. Four metal detectors have been installed and are operational: two at the cathedral’s main entrance at its façade, one at the entrance to the dome, and one by the Porta dei Canonici, which is used by churchgoers. Three more will be installed by April 1: one each in the Opera del Duomo Museum, the Baptistery and the bell tower. The cathedral also increased security staff at its entrances in December 2017.